We've been voraciously gobbling up releases from Trojan Records for some time now. They have a compilation disk for every little sub-genre of reggae music, and that essentially makes them the curators for the sounds of Jamaica. 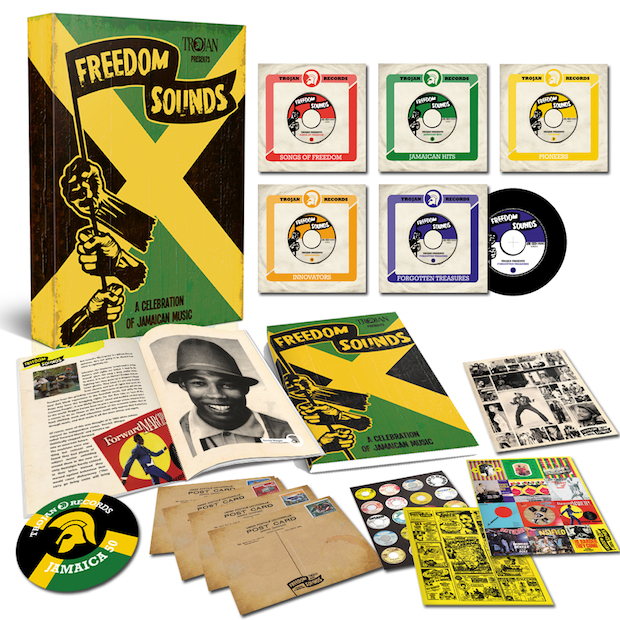 To celebrate the 50th year of Jamaican independence, Trojan Records have released what might be their greatest compilation to date, spanning over 5 CD's and having some 50 new tracks never before committed to CD. Alongside the usual suspects such as Bob Marley and the Wailers, Gregory Issacs, Toots and the Maytals, Desmond Dekker and Barrington Levy are lesser known artists that equally deserve your attention. Quite honestly, this is the perfect compilation to wind down your summer with. In keeping with the tradition of the box set, the set includes a 52 page book full of pics and commentary, some art cards, and a set of Jamaica 50 stickers. You can get it direct from the label here, or you can find it wherever they sell fine music.